Republicans on the Senate Judiciary Committee brought in a prosecutor to question Dr. Christine Blasey Ford, who offered personal testimony and spoke in a measured, almost conciliatory tone as she described, in graphic detail, her memories of being sexually assaulted at 15. But when Brett Kavanaugh, who is under consideration for a lifetime appointment to the highest court in the country, yelled his testimony, indignant that his reputation as a Yale Law School graduate, coach, father, and church-goer dare be scrutinized, Republican senators swooped in to offer support and lament the injustice of seeing a good man’s reputation tarnished. Sen. John Cornyn and Sen. Lindsey Graham, who have said that Ford’s testimony does not change their decision to support Kavanaugh or hold the vote on Friday, even teared up during Kavanaugh’s testimony. “The burden is not on you to disprove these allegations,” Cornyn told Kavanaugh—though it is Kavanaugh’s character that is the subject of this confirmation process, not Ford’s. Cornyn and Graham, who were silent during Ford’s testimony, very quickly sidelined prosecutor Rachel Mitchell in order to extend support to Kavanaugh. “I can’t think of a more embarrassing scandal for the Senate since the McCarthy hearings. When the comment was about the cruelty of the process toward the people involved, and the question was asked, have you no sense of decency? And I am afraid we have lost that,” Cornyn said. 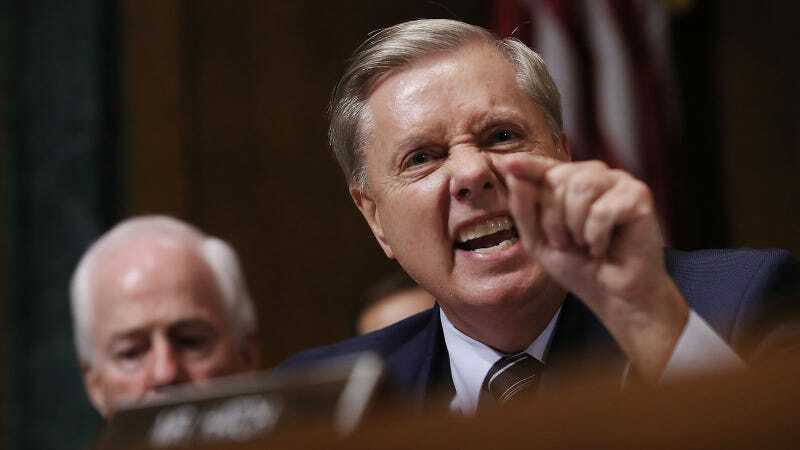 Graham was so indignant that he could barely control the emotion in his voice. “This is the most unethical sham since I’ve been in politics,” he said, eyes wide. “This man is not a monster,” said Senate Judiciary Committee chair Chuck Grassley, stressing that Kavanaugh is an honorable, fair judge. Maybe, but we know it doesn’t take a monster to do the things Ford described. There is nothing more mundane, in fact.